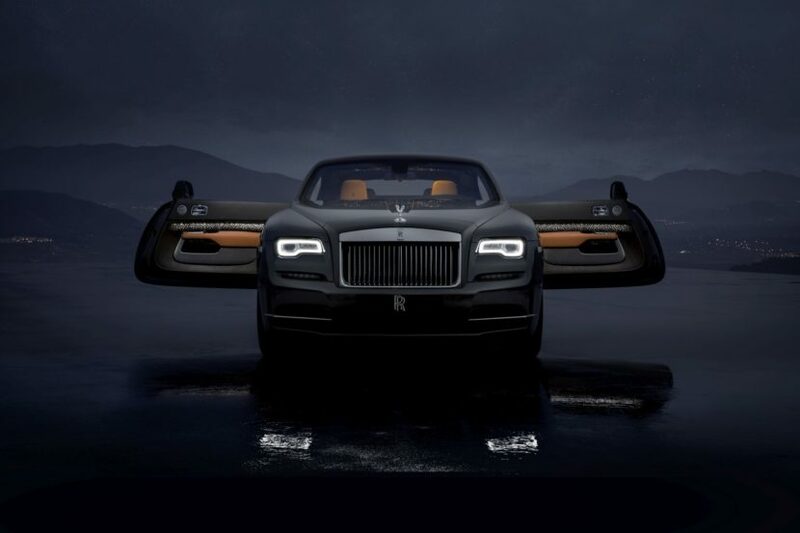 In a bold expression of dynamic luxury, Rolls-Royce unveils the Wraith Luminary Collection. Inspired by those who lead where others follow, the Wraith Luminary Collection will light the way for the luxury trailblazer. In response to an ongoing global demand for Rolls-Royce Collection Cars, the marque has created a Limited Collection of just 55 of these spectacular Wraiths. These models will be part of the collectible Bespoke masterpieces, envisioned by the Rolls-Royce Bespoke design team. 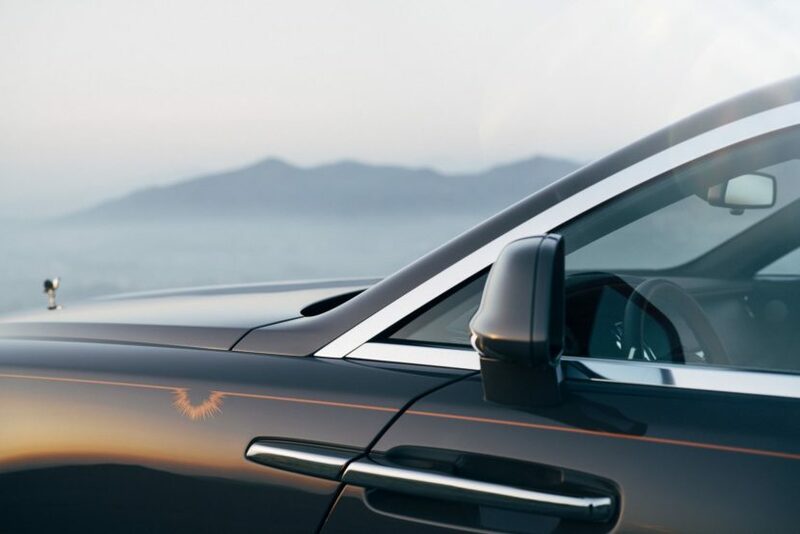 The heady shade of the golden hour’s sun rays inspire the car’s newly developed exterior paint, Sunburst Grey. To make things more interesting, a hand-painted Sunburst Motif coachline was added along with hand-painted Wake Channel Lines on the Wraith’s bonnet and pinstripes applied to the wheel centers, each in Saddlery Tan, bearing reference to the color of the interior leather, complimenting the intricate details awaiting inside. On opening the coach doors, one is met by a statement of modern luxury, as light flows from the front into the rear passenger compartment. The Collection’s defining feature, Tudor Oak wood, sourced from the forests of the Czech Republic, selected for its depth of color and the density of the grain structure, is for the first time, illuminated. The light of 176 LEDs permeates through an intricately perforated design in the unique Tudor Oak veneer meant to mimic the trailing light of a shooting star. Linked to the controls of the starlight headliner, the cabin’s veneer surrounds Wraith’s occupants in an ambient glow of light. Speaking of shooting stars, the Rolls-Royce Bespoke Collective, a talented group of engineers, designers and craftspeople located at the Home of Rolls-Royce in Goodwood, West Sussex, have brought further theatre to the cabin of Luminary in the form of brilliant shooting stars. 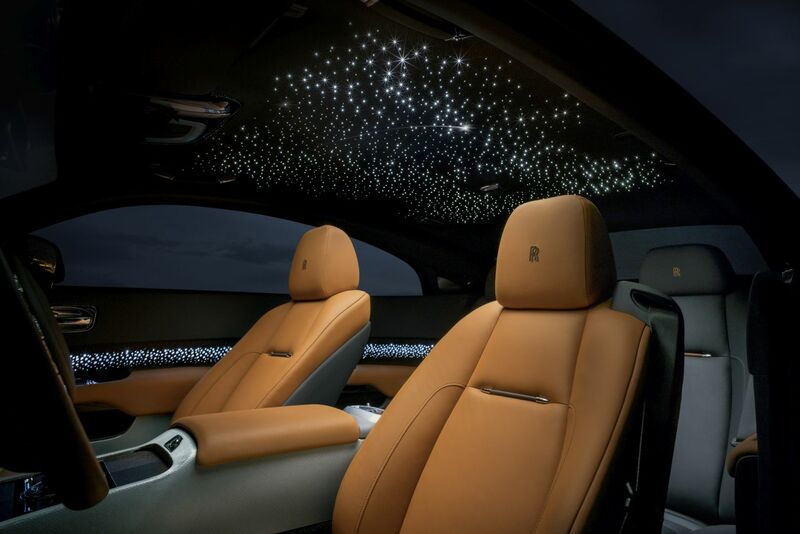 The prized Rolls-Royce starlight headliner, a handwoven configuration of 1340 fibre optic lights which act as a glittering night sky, takes a bold new step as it incorporates shooting stars into the constellation. Taking nearly 20 hours to configure, eight shooting stars fire at random, predominantly over the front seats, in recognition of Wraith’s owner-driver appeal. Wraith Luminary’s cockpit is trimmed in Saddlery Tan, though the rear seats contrast in Anthracite leather, thus highlighting the prominence of the driver’s position. Contrast piping and stitching are also noticeable, allowing the front of the car to meet with the rear. Alternatively, a more dramatic contrast can be selected by specifying Seashell colored leather in the rear, both of which will be perfectly coalesced by the inclusion of a two-tone steering wheel. 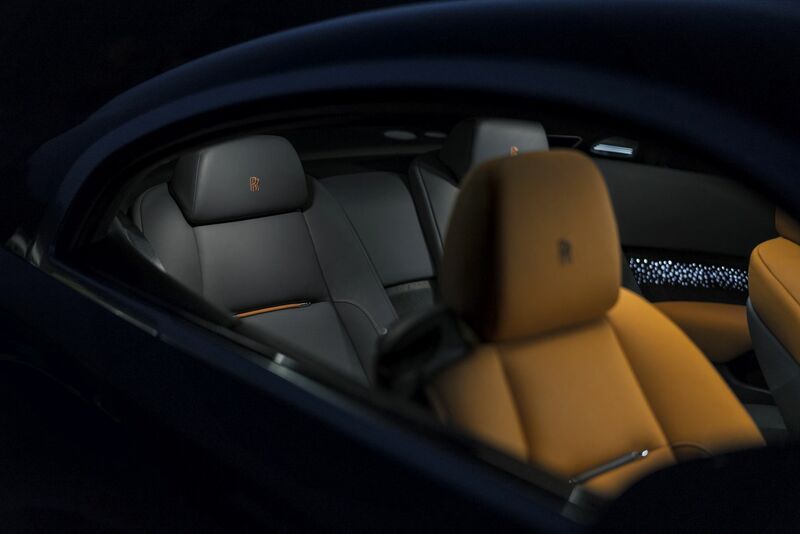 The Rolls-Royce Bespoke Collective continually seeks inspiration from external trends and influences. In a progressive step, the application of hand-woven stainless steel fabric, a highly contemporary and innovative new technique in luxury craft, is appointed to the central transmission tunnel and door panniers, contrasting the Tudor Oak wood and Saddlery Tan leather. Incorporating strands which are 0.08 mm – 0.19 mm in diameter, this technical fiber is woven in a pattern oriented at precisely 45 degrees, to complement the lines of the interior and provide a uniform appearance throughout the passenger compartment when viewed from either side. Taking three days to produce in a ‘clean room’ environment, the fabric is manipulated to cloak the center console, modified from use in an industrial environment to create a finish befitting the interior of a Rolls-Royce motor car, refracting the light of the unique illuminated paneling in the doors. As a final touch, the car’s tread plates bear the provenance of this unique collection. ‘WRAITH LUMINARY COLLECTION – ONE OF FIFTY-FIVE’ is engraved in hand-polished stainless steel.